These are sites that we and our guests have particularly enjoyed. Please contact them directly for full current information, like opening times and if you need to book for two night minimum. Our closest site is The Wheel Caravan Park in Falkirk. Witches Craig Caravan & Camping Park, Blair Drummond Caravan Park both near Stirling, The Woods Caravan Park at Alva, Carrs Hill at Denny and Beecraigs Camping by Linlithgow are all great sites, close by. Callander is also a good base for your last night and Keltie Bridge and Gart Caravan Parks are good in this area. Cashel Campsite or Milarrochy Bay on Loch Lomond- both are part of the Camping and Caravanning Club and you will get discounts with our campervans’ Privilege Club membership. Both are stunning sites, on the loch and provide an easy last morning drive back to Falkirk. Cobbleland Campsite near Aberfoyle, is also part of the Camping and Caravanning Club and a very good site for your final night. Also an easy driving distance for last night before return to Falkirk. Belhaven Bay Caravan & Camping Park and Dunbar Camping and Caravanning Club Site are both by Belhaven Beach a large sandy beach and close to the interesting town of Dunbar. We also love Thortonloch, a campsite on a smaller sandy beach. It’s not everyone’s cuppa as it is next to a power station, that’s what keeps it quieter for us to enjoy perhaps. Milton of Fonab is the best site, closest to the town centre. It is a bit further but still possible to drive from here to us after your last night also. Glenmore on Loch Morlich (Privilege Club discount), Dalraddy Holiday Park and Rothiemurcas are all lovely sites amongst the ancient pines and close to Aviemore. Ballater Caravan Park, Granton on Spey Caravan Park & Braemar Caravan Park are great sites for their respective villages. Sauchope at Crail is a lovely wee site on a rocky beach and an easy walk into the village. Silverdyke Park at Anstruther is another well kept site in this area. Riverview Caravan Park, Monifeith is a good site, next to the vast beach and handy for day tripping into Dundee. Aberlour Gardens Caravan & Camping Park is best situated for Malt Whisky lovers. It’s a beautiful site for nature lovers also. Speyside by Craigellachie (Privilege Club Discount) is also a good base for touring distilleries. West Beach Caravan Park is a great site and they really appreciate VWs here! Nairn Camping & Caravanning Club site, handy for the town and its beaches. Rosemarkie Camping & Caravanning Club site is great and has direct beach access. Fortrose Bay Campsite is on a shingly beach but still good dolphin spotting territory. Loch Ness Shores Camping & Caravanning Club once again comes up trumps. As with all Club sites, you are entitled to discounts when travelling in our vehicles. 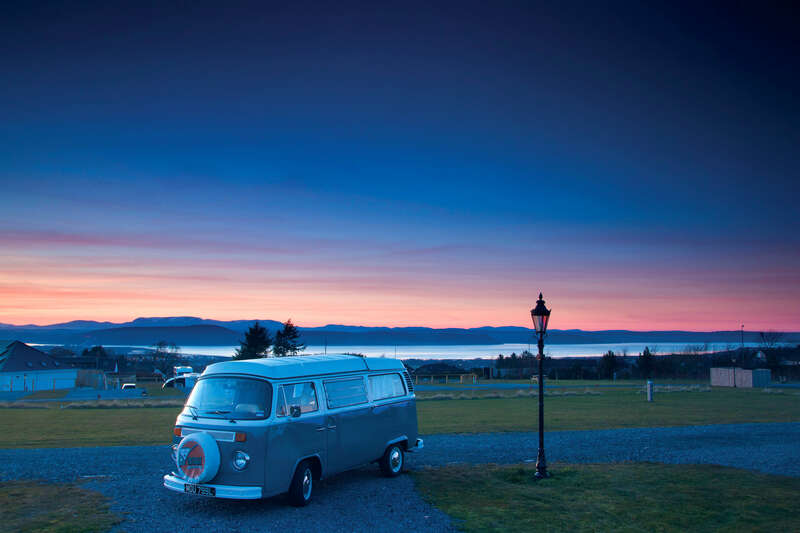 Bunchrew Caravan Park is north of the loch, on the Beauly Firth and is a well maintained and friendly site. Ardtower is a good site closer to Culloden and easy for day trips into Inverness. Cannich Woodland Camping is next to the Nature Reserve and run by an outdoors enthusiast, happy to share his knowledge. Applecross Campsite– a good resting point, before or after Bealach Na Ba. Dine out at nearby Applecross Inn. The Sands, Gairloch- the campervan pitches are not quite on the beach but overlooking the sea, with views to Skye. It is a short walk from Big Sand Beach. Inverewe Gardens, Poolewe Camping and Caravanning Club is a very friendly and well-run campsite, overlooking the Loch. A few miles south of the above site is Firemore, a wild camping experience where you pay for the privilege but it’s so worth it. As your money is going towards the upkeep of this glorious beach, there’s no reason to mind a small fee. Broomfield, Ullapool– lochside site in Ullapool. Great nearby fish and chip shop and ideal for Loopallu festival. Ardmair Point stunning site on a sheltered sea loch. The local seals may well entertain you. The Shore Caravan Site at Achmelvich- next to one of Scotland’s award-winning beaches and open later in the season than the nearby but also great Clachtoll Beach Campsite. Scourie Caravan and Camping Park, great site, interesting village and lots of wildlife spotting opportunities. Sango Sands, Durness- don’t miss this beach, grab a pitch overlooking it if you can. Halladale Inn, Melvich on the one hand, you could say this is almost like camping in a pub carpark (but with electric hook-up and well- kept toilet/shower block.) On the other hand, you could say this is a quiet spot near an amazing beach and the pub being on hand, could well be a benefit to many! Thurso Bay Caravan & Camping Park is handy for surf fans and also those catching the ferry from Scrabster to Stromness on Orkney. Tweedside Caravan Park in Innerleithen is centrally located and handy for Glentress Mountain Biking and Innerleithen Downhill Track. Also good for those wishing to fish (by permit) for Salmon and Trout. Jedburgh Camping and Caravanning Club site is well-maintained and handy for all the historical and natural attractions in the area. Brighouse Bay– good site near Kirkudbright, a beach and a pony trekking centre. Sandyhills Bay Leisure Park- lovely site next to a long sandy beach, just south of Dalbeattie. Culzean Castle Camping and Caravanning Club site –camp in the grounds of this amazing National Trust property. Loch Lomond Holiday Park- a well run and friendly site with direct loch access. Beinglas Farm Campsite- great location for The Drovers Inn and even has its own bar on the site also. There is no electric hook-up at this site. Roseview Camping and Caravan Park is the best site, closest to the town itself that we have found. North Ledaig Caravan Park is also a lovely site, just not as handy for the town. Also further afield but very good is the Oban Caravanning & Camping Club site. Seaview Caravan & Camping Park, Benderloch a friendly site, situated by a beach. Glencoe Mountain -is the site for thrill seekers, outdoor activities abound here. The Red Squirrel- can get busy and sometimes a bit rowdy in high season (It’s the closest campsite to the Claichaig Inn.) The flipside is, you can find it very tranquil at other times. There’s no electric hook-up here, so it’s almost a wild camping experience, with the toilet block on hand. Invercoe- at the end of the Glen, on the Loch itself this is a good, friendly site. Caolasnacon Caravan and Campsite, a beautiful campsite, not far from Glencoe. Glen Nevis Campsite- a stunning location, nestled amongst the mountains. Bunree Caravan Club Site- beautiful lochside location. Sunnyside Croft a larger site, also with a path leading to the beach. Camusdarach another larger site with path to beach. Invercaimbe situated by the beach, with clear views to Rum, Muck, Eigg and Skye. Sligachan– nice site, next to the convenience of the Sligachan Hotel and it’s wonderful whisky bar! Glenbrittle- spectacular setting, next to sandy beach and at the end of a single track road. Kinloch Campsite- lovely wee lochside campsite, overlooked by the majestic MacLeod’s Tables. Uig Bay Caravan & Campsite is very handy for the ferry terminal at Uig, also for exploring Trotternish. Skye Camping and Caravanning Club Site- great lochside/working croft campsite. Ashaig Campsite- good site, near a sandy beach and handy for The Skye Bridge and Broadford. Torvaig Campsite- handy for Portree. Horgaborst- if you’ve come to ogle at those Harris west coast beaches, this is the site for you! Lickisto Blackhouse- a small but well run east coast Harris site, handy for Tarbert and the ferry to Skye. Ardroil, Uig Bay- we love this place, simple camping in the dunes, next to a stunning, huge sandy beach. Nothing between here and North America, except the sea! Balranald Campsite, North Uist- within an RSPB Nature Reserve and next to another spectacular sandy beach we love. Kilbride Campsite, South Uist- across the road from a sheltered sandy bay on the south of the island. Sheiling Holidays- super friendly site, close to Oban Ferry. Fidden Farm- next to a lovely sandy beach and handy for the ferry to Iona. Crannich- small, friendly site, central on the island and closer to Tobermory. Kintra Campsite- without electric hook-up, amongst the dunes at another beach we love. Port Mor Campsite- with electric hook-up and bistro and bus links to nearby distilleries. Point of Ness Campsite, Mainland- a good base, close to Stromness for exploring the numerous historical sites on Orkney Mainland. It is on a cliff with great views to Hoy and isn’t recommended if high winds are expected. Pickaquoy Campsite, Kirkwall, Mainland- this is in the main town of Kirkwall and next to the leisure complex. So not really what you picture when thinking of camping on Orkney but the convenience offsets the town setting for many. Birsay Outdoor Centre & Campsite, Mainland- more remote, on the northwest of the mainland, with stunning sunsets when the weather allows. All of campervans get discounts on the Camping & Caravanning Club Sites, as they are members of ‘The Privilege Club’.